Charles Darwin University vocal students have received the highest accolades for their singing talents. 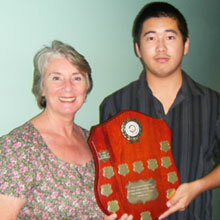 Kang Wang and Luke Walker received first places in their sections at the recent North Australian Eisteddfod. Both students attribute their success in no small part to the dedicated tutelage of their teacher Kathy Banks. Kang, a tenor, came first in both the Aria and Lieder sections and went on to win the Kathleen Barrow Memorial Award for most promising boy vocalist, (changed voice). Luke, a counter-tenor, was awarded first place in the sacred section. Two days after the competition, Luke travelled to Mount Gambier where he performed by invitation in the Mayoral Gala and was announced winner of the 2008 Mayoral Gala.